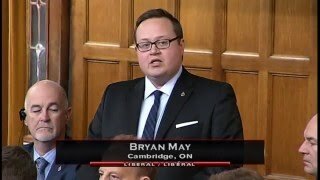 I asked our Prime Minister Justin Trudeau for an update on how our government is helping to protect Canadians with disabilities and how we are creating a barrier-free Canada. Added December 11, 2018 from Bryan May. Added June 30, 2017 from Bryan May. Added June 9, 2017 from Bryan May. Added April 14, 2017 from Bryan May. 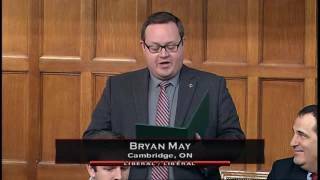 Cambridge Member of Parliament Bryan May wishes constituents a Happy Easter. Music by Bensound. Added April 13, 2017 from Bryan May. 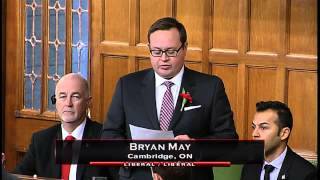 Cambridge Member of Parliament Bryan May addresses the House of Commons on Armenian Genocide Remembrance. 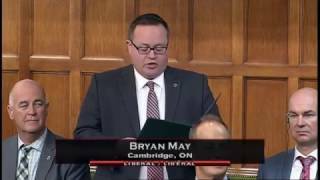 Added February 27, 2017 from Bryan May. 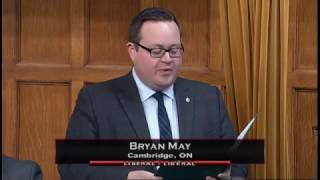 Cambridge Member of Parliament Bryan May updates the House of Commons of the study of innovative poverty reduction strategies currently being undertaken by the Standing Committee on Human Resources, Skills and Social Development, and Status of Persons with Disabilities. Added February 15, 2017 from Bryan May. 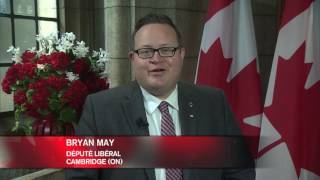 Cambridge Member of Parliament Bryan May congratulates the Terry Fox Research Institute, Princess Margaret Cancer Centre and the BC Cancer Agency on their collaboration on a new pilot project to combine the work of investigators and clinicians in the fight against cancer. Added January 31, 2017 from Bryan May. 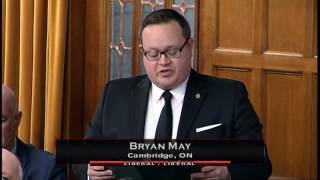 Cambridge Member of Parliament Bryan May pays tribute to the late Hon. 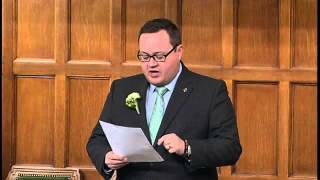 Andrew Telegdi, former Member of Parliament for Kitchener-Waterloo. Added December 23, 2016 from Bryan May. The holiday season is upon us, and it's a wonderful opportunity to spend time with our loved ones. From my family to yours, Merry Christmas and Happy Holidays! Added November 30, 2016 from Bryan May. 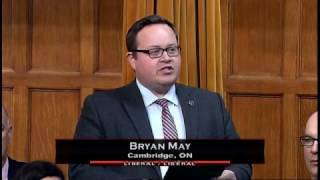 Cambridge Member of Parliament Bryan May speaks about the importance of the Canada Pension Plan and why he supports efforts to strengthen it with Bill C-26. Added November 18, 2016 from Bryan May. 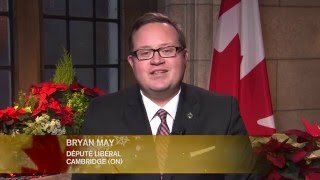 Cambridge MP Bryan May speaks about the Cambridge Santa Claus Parade Thank you, Mr. Speaker. 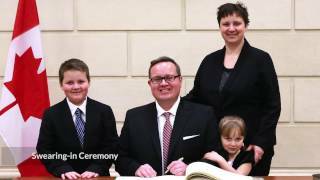 Yesterday was the one year anniversary of my swearing-in as the Member of Parliament for Cambridge, and I am proud to stand here today representing the fine people of my riding. I am humbled and honoured by their support. 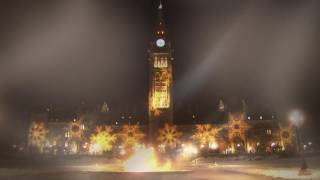 This weekend, the people of Cambridge will line the sidewalks of Hespeler Road for the 44th annual Cambridge Santa Claus Parade. Every year, whether it’s raining or snowing, and regardless of how cold it is, my constituents come out by the thousands to watch this extraordinary showcase of the schools, community organizations, businesses, and non-profits that make our community so great. As I have the good fortune of having my office located on the parade route, I am proud to offer some holiday warmth for my constituents in the form of hot chocolate and candy canes. 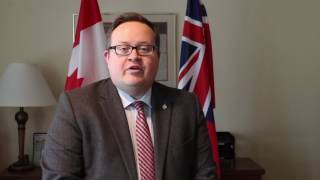 This Saturday, I encourage all of my constituents to come out to the Cambridge Santa Claus parade for some family fun, and stop by my office for a quick warm up. See you there! Added November 10, 2016 from Bryan May. Added October 31, 2016 from Bryan May. 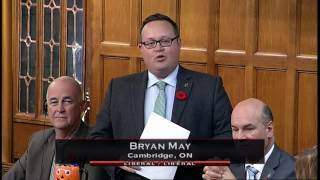 Thank you, Mr. Speaker, for allowing me to speak in the House to recognize Halloween's biggest fan, my dad, Ron May. Have a safe and happy Halloween! Added October 27, 2016 from Bryan May. Added October 26, 2016 from Bryan May. 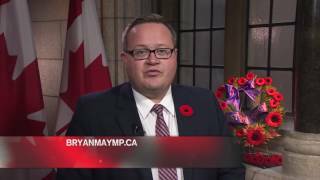 Added October 19, 2016 from Bryan May. 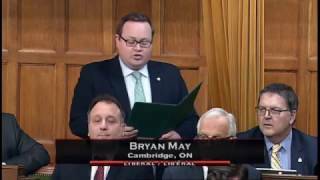 One year ago today, the people of Cambridge elected me to represent them in the House of Commons. I'm so thankful and humbled by this incredible honour. Thank you to everyone for your support! Added June 30, 2016 from Bryan May. Added June 3, 2016 from Bryan May. Added May 31, 2016 from Bryan May. 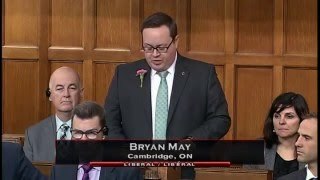 Added March 11, 2016 from Bryan May. 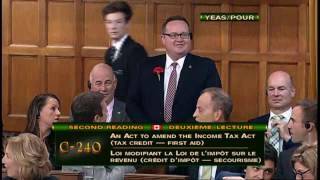 Today I had the opportunity to ask my first question to the government in Question Period. 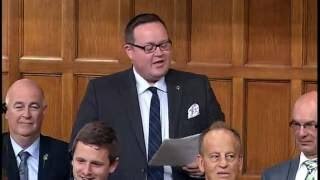 Waterloo Region has almost 1000 beef farmers, so I asked Minister Lawrence MacAulay, Minister of Agriculture and Agri-Food about how our government is supporting beef farmers. Added February 26, 2016 from Bryan May. 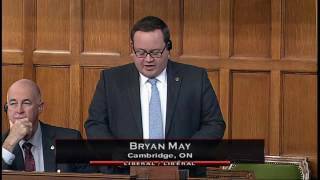 On February 23rd, I spoke in the House to pay tribute to an inspirational leader, former Cambridge Mayor Claudette Millar. 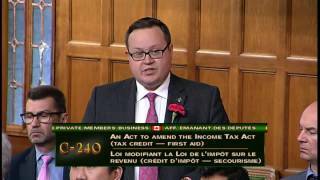 Today I was excited to introduce my Private Member's Bill: a tax credit for individuals who take first aid, CPR, and AED training. Added January 15, 2016 from Bryan May. 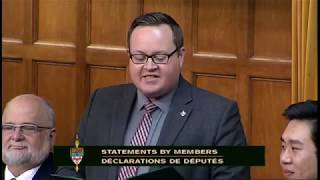 December 11, 2015 - Today I rose in the House of Commons to make my first statement and to pay my respects to James Chaplin, a man who changed many lives in our community. The holiday season is a wonderful opportunity to spend time with friends and family. 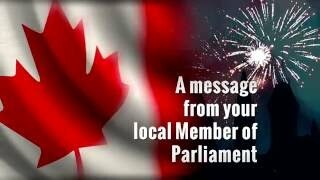 However you choose to celebrate, I wish you and your family a safe and happy holiday season. Merry Christmas and Happy Holidays.